“The unlawful assembly of the people from Jawaharlal Nehru University also included few lawyers in their court dresses, not only they are seen shouting slogans in the court premises, but they are also indulging in manhandling journalists. 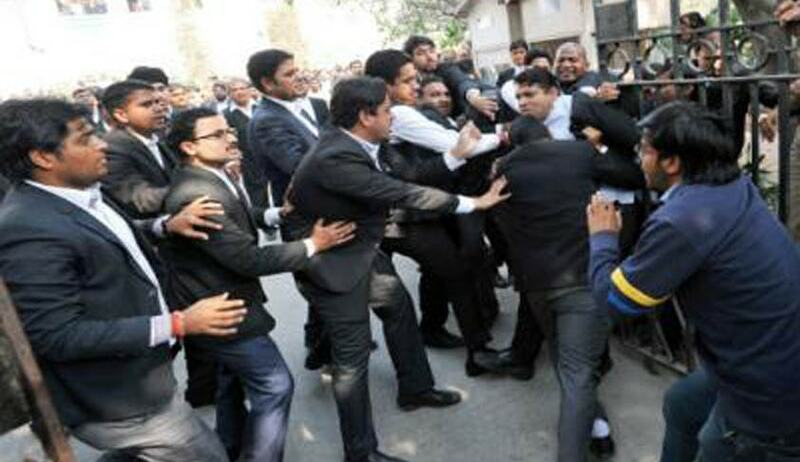 The role of such lawyers is really shameful and the incident is very unfortunate.. All the members of the Bar Council of India were of the opinion that whatever might have been the situation or the reason behind the incident, we cannot ignore and tolerate such misconduct on the part of advocates” observations in the BCI order. The Bar Council of India (BCI) today informed the Supreme Court that it has constituted a high-level committee to enquire into two days of violence at the Patiala House Court allegedly indulged in by lawyers during the court appearance of Kanhaiya Kumar, arrested on charges of sedition in the JNU case. It will be a three – member committee consisting of one former Chief Justice of High Court Hon’ble Justice Narasimha Reddy, senior advocate M N Krishnamani and BCI member S Prabakaran, said an affidavit filed by BCI Chairman Manan Kumar Mishra. The order passed by BCI Chairman on February 17 said : “The height of the issue is that even after the order of the supreme court, the lawyers did not follow it, rather in the second half of the day when the supreme court constituted a committee of senior lawyers to visit the court premises a handful of lawyers have gone to the extent of abusing the senior and respectable members of the Bar. These disgruntled and unruly advocates have downgraded the dignity and decorum of the legal profession. Shouting of slogans, use of abusive languages against the members of the team appointed by SC and the alleged act of pelting stones on their vehicles is a very serious misconduct which the Bar Council of India is not going to tolerate”. “Because of this misconduct of only handful lawyers of the Patiala House Courts, the image of the legal fraternity throughout the country has been maligned. Some of the media have branded these lawyers as goons in black courts…these handful of lawyers have diverted the attention of the entire country towards the role of advocates and the Bar. Even the apex court was compelled to intervene in the matter”, it said.